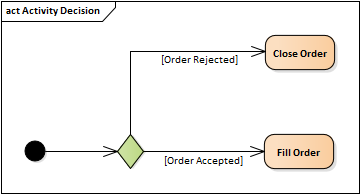 A Decision is an element of an Activity diagram or Interaction Overview diagram that indicates a point of conditional progression: if a condition is True, then processing continues one way; if not, then another. This can also be used as a Merge node in that multiple alternative flows can be merged (but not synchronized) to form one flow. These examples show both of these modes of using the decision element. See UML Superstructure Specification, v2.1.1, figure 12.77, p. 363. See UML Superstructure Specification, v2.1.1, figure 12.106, p. 388. 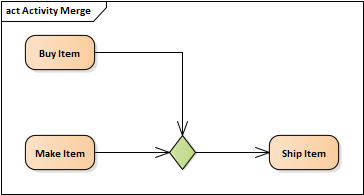 A decision node is a control node that chooses between outgoing flows. A decision node has one incoming edge and multiple outgoing activity edges. A merge node is a control node that brings together multiple alternate flows. It is not used to synchronize concurrent flows but to accept one among several alternate flows ... A merge node has multiple incoming edges and a single outgoing edge.